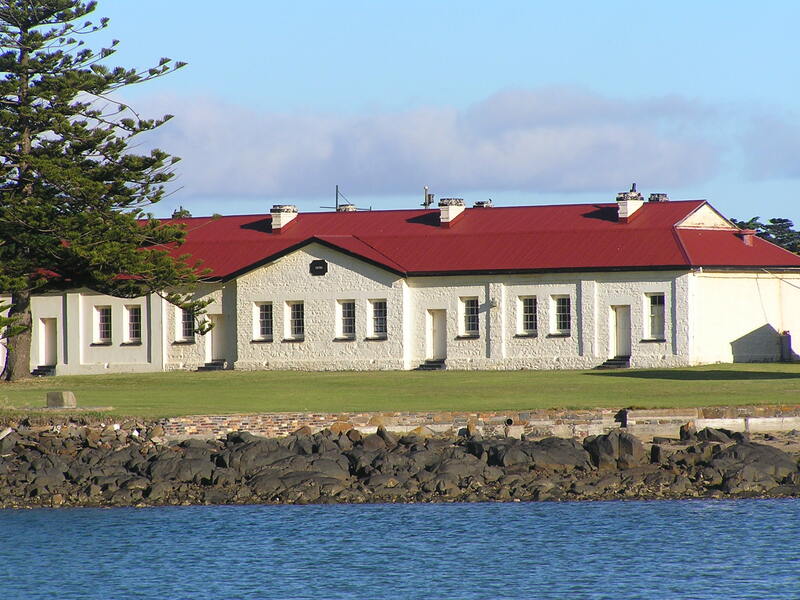 Low Head Pilot Station, situated at the mouth of the Tamar River in northern Tasmania, is the oldest group of pilot buildings in Australia. While it was the first station to operate it is the third oldest pilot service after the private operations of Sydney and Hobart. The pilot service dates from 1805, with the appointment of William House as Harbour Master at Port Dalrymple, and the first building on the site was probably in 1806. The pilot service still operates from this site today. The first European settlers to arrive in the Tamar Valley came with Lieutenant Colonel William Paterson in November 1804. They landed and set up camp at Outer Cove (now George Town), established their settlement at York Town on the West Tamar, and in 1806 started moving to Launceston. The Tamar River is a dangerous estuary with a complicated navigation channel which has always required the help of pilots. The oldest building on the site is Pilots’ Row. It was a terrace of four apartments, each with four rooms, to house the pilots and their families. It dates from 1835 and was designed by John Lee Archer, the colonial Architect. It replaced earlier wooden pilot buildings. The convict boatmen continued to live in their wooden huts. As the station grew other buildings were added. These include the Coxwain’s Cottage (1847), Boat Crew Cottages (1859, 1860, 1861, 1962), the School House (1866), Pilot’s Cottage (1917), Church, Octagonal Chart Room, Workshop and Boat Shed. Leading Lights - The two white towers with lights and their accompanying light keeper’s cottages were built in 1882 to mark the channel line for safe entry into the river. They replace earlier unlit lead towers which had been erected in the 1840s. Replica Semaphore Signal - This is one of the four signal posts which relayed messages between Launceston and Low Head. The other signal posts, now restored, are located on Mt George (George Town), Mt Direction and Windmill Hill (Launceston). Lighthouse—It is the third oldest lightstation in the Commonwealth after the Macquarie lighthouse (near Sydney 1818) and Iron Pot (Derwent River near Hobart). The first lighthouse was built in 1833, to a design by John Lee Archer. It was replaced by the present lighthouse in 1890. It is still in service although is now fully automated. Foghorn - One of only two operating foghorns in Australia. In service from 1927 to 1973 it has now been restored and is sounded at noon each Sunday. 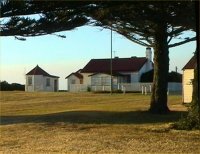 Telegraph Station - This building was erected in the 1860s as the station for the telegraph cable which operated between Low Head and Victoria. 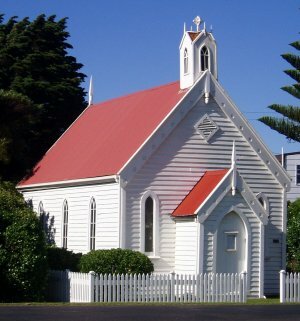 It was later leased by the Catholic Church as a holiday home for the Presentation Sisters and is now a private residence.